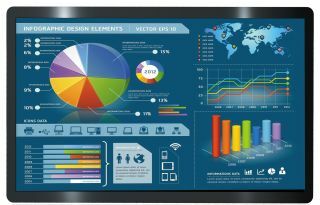 The What: Arista has launched the ADM-2155BP and ADM-2155BP-A01 Multi-Touch LCD Displays. Meeting IP50 environmental protection requirements, these rugged 55-inch displays are available in two screen resolutions—1920x1080 HD (ADM-2155BP) and 3840x2160 UHD (ADM-2155BP-A01). The What Else: Arista’s ADM-2155BP display includes an RS-232 for remote OSD (On Screen Display) control. The basic functions and many features of the display, such as the turn on, turn off, (standby) power of the display, video source selection (HDMI/DVI/VGA), and brightness control can all be managed via RS-232. The OSD will appear on screen when the serial command is sent. The ADM-2155BP has HDMI, DVI, and VGA (legacy analog video) inputs. On the I/O panel, there is an audio input connector to connect to the PC audio output, and an audio output connector to connect to an audio amplifier. Models with the touchscreen option also include a USB type-B connector on the I/O panel. The ADM-2155BP-A01 is the 3840x2160 UHD LCD monitor with quad-view function built-in. The RS-232 connector on the ADM-2155BP-A01’s I/O panel is for remote OSD control via RS-232. The basic functions and many features of the display such as the turn on, turn off, (standby) power of the display, video sources selection (HDMI-1/HDMI-2/HDMI-3/HDMI-4), and brightness control can all be controlled via RS-232. The OSD will appear on screen when the serial command is sent. With its built-in quad-view video processor, the ADM-2155BP-A01 can display four video feeds in quad-view, picture-in-picture, and picture-on-picture format. The ADM-2155BP-A01 is shipped with Arista’s MVD-108 control console. The MVD-108 provides rich feature control with just a single keystroke. With the MVD-108, the users can toggle the display functions between quad-view, picture-in-picture, picture-on-picture, or single video content display. Both the ADM-2155BP and the ADM-2155BP-A01 have a multi-function expansion slot that facilitates the integration of an HDBaseT receiver for applications requiring the ability to display remote video content. This expansion slot can also be used for the integration of an AV over IP receiver for applications that require the display to show multiple video feeds over the network. There is also a computer module available for whiteboard functions in classrooms, conference rooms, and similar environments. MicroBox-1100A-E01 computer module: Featuring an Intel Atom E3845 1.9GHz quad-core CPU and up to 8GB DDR3 memory with Microsoft Windows, this rackmount computer can serve as a system controller. ARD-1006-A07-RX: This HDBaseT receiver is a copper interface module featuring three front-accessible USB 2.0 ports and a two-port 10/100Mbps Ethernet pass-through hub, along with an IR control port. ARD-1006-A31-RX: This is a copper interface AV-over-IP receiver module featuring a two-port USB 2.0 hub, a gigabit Ethernet pass-through port, an IR control port, plus an audio output jack. AVC-1006-SH: This module provides the ability to display the contents from an SDI (Serial Digital Interface) source—eliminating all cable connections between the monitor and the video converter. The Bottom Line: Both displays provide a wealth of integrated video inputs in addition to offering a multi-function expansion slot to facilitate an integrated computer as well as HDBaseT or AV-over-IP extension capability, making them well suited for displaying video content over networks or the integration of a computer for whiteboard in classrooms, conference rooms, and similar applications.